In section 2.1 we looked at manual input devices and talked about how these require a large amount of human interaction in order to get data into a computer. In this section we will focus on direct input devices. Direct input devices require less human interaction in order to get data into a computer. Direct input devices do not require much human interaction to get their data into a computer system. All a human has to do to use a Barcode Reader is point the reader at the barcode and pull the trigger. The reader will do the rest. Click the images to the left to move to more information about each one. 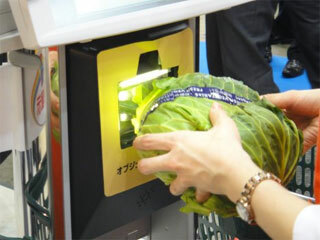 Information held on a card's 'magnetic stripe' is read by swiping the card through a strip reader. Hotel room cards contain data on the stripe that will unlock the door once inserted into the reader. Reads information from magnetic stripes found on Bank Cards, Membership Cards and Hotel Door Cards etc. Data contained on the card's stripe is read by pulling the card through the magnetic stripe reader. This is known as 'swiping'. 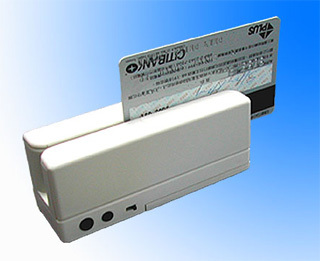 The magnetic stripe reader then sends data from the card into the computer for processing. ATM's use these readers to process the information on bank cards. EFTPOS (Electronic Funds Transfer Point of Sale) use the readers to transfer customer's money from their bank accounts when they purchase goods in stores. Hotel rooms sometimes use magnetic stripe readers in place of door keys. People who want to enter a room would swipe their card through the reader in order to open the door. Entering data is very fast. You just swipe the card through the machine. The magnetic stripe on cards can only hold a small amount of data. No possibly of data entry errors as there is no typing involved. The cards need to be in contact with the reader in order to be used. The stripes on cards are not affected by water and so quite robust (not easily damaged). If the stripe does get damaged then the data is lost (unreadable). Data held on the card cannot be read by eye so bank details etc are safe. Magnetic stripes on cards are easily duplicated (known as card cloning). identification number to be entered. on a magnetic stripe . Chip and PIN Readers . These allow people to pay for goods and services electronically at EFTPOS terminals (electronic funds transfer point of sale). The chip and pin reader works by inserting a bank/credit card into a slot and then entering a PIN (personal identification number). The PIN ensures that the person with the bank card is the genuine owner. 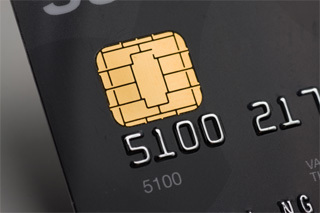 Only the owner of the card should know the PIN and money can only be transferred with the correct number. More secure than magnetic stripe readers as the user needs to know the correct PIN. 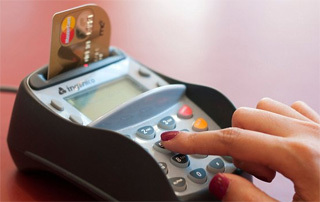 It is possible to forget your PIN which means you cannot make payments with your card . Information contained on the chip is harder to clone (copy) than it is to copy magnetic stripes . People can look over your shoulder as you enter your PIN. This makes it possible to access your money if they ever stole your card. Chips can hold more data than magnetic stripes can. Barcodes contain information about products and can be read with scanners. A barcode on a package being scanned. 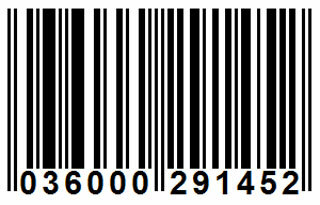 Barcodes are found on items that we buy in stores. 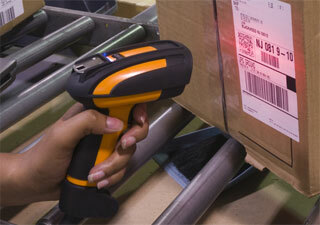 Hand held barcode scanners are used to read barcodes on large items. Used to read information that is stored on product's barcodes. The barcode scanner reads the information stored on the barcode using a visible red light which is reflected and translated into digital information. The barcode does not store the price of the product. This information is held in a computer database and accessed using the product id. Note: By storing the price in a database instead of on individual bar codes, it is easier to change (if you had a sale for example). All you would do is change the price in the database instead of having to replace the barcodes on each of the items. Once a barcode has been scanned, a computer can read the information stored on the barcode and access details about the product that are stored in a database. Barcode scanners are usually built into POS (point of sale) terminals in supermarkets. Handheld scanners are also commonly used to read bar codes (usually if items are too large and heavy to move to the scanner). 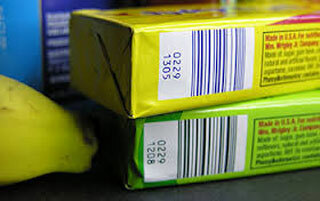 Used in supermarkets, stores and warehouses where goods are marked with a barcode. Barcodes hold information about the product which is linked to a computer database. This enables automatic very fast itemised billing to take place. They are used in libraries to scan in library cards and read ISBN numbers on books to find out which ones are on loan. They are used in keeping track of packages that are being delivered to different locations. Also used in organising luggage in airports (helps ensure that luggage is loaded onto the correct plane). Quick and easy to change product prices. Only the price data in the database needs to updated. There is no need to change individual prices on each of the item's bar codes. Quite an expensive way to gather information. Each item needs a barcode and the scanners / computer technology / database needed is also expensive. Quick and easy way of getting information into a system. Bar codes can be swapped on items which means people may pay less for more expensive items. Very accurate as there is no manual typing involved. Rely on undamaged bar codes in order to function. Optical Mark Reader automatically inputting the answers given on a multiple choice form. 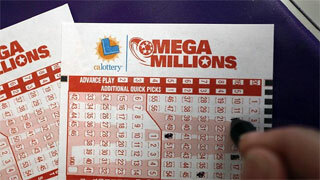 They can also read shaded areas on lotto tickets. System which automatically reads marks made in pen or pencil. Typically used to read multiple choice examinations where students shade in (mark) answers that they think are correct. The OMR reader shines a light onto the form and less light is reflected where a pencil mark has been made. This allows the reader to tell which options have been chosen and sends the results back to a computer. Once the data is on a computer it can be quickly analysed. 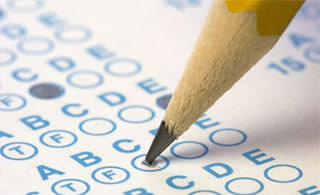 For example: the computer will work out the grade of a multiple choice test. Optimal Mark Readers can input the data held on forms (such as multiple choice exams) very fast. Up to 4000 sheets per hour can be processed this way. Imagine how long it would take to mark 4000 multiple choice tests by eye!! But are typically used on any document that has multiple choice responses that are shaded in. Extremely fast way of inputting information into a computer. Forms need to be accurately designed to make sure that the marks/shading are in correct position to be read by the device. Very accurate as document's data is fed into the computer automatically with no manual typing. If forms have been incorrectly filled in they cannot be read properly. enter form information into a computer. Can only read shaded areas (Cannot input or read text). Forms can jam in the machine as they are fed through. Printed text on a document being scanned as part of the 'digitizing' process. 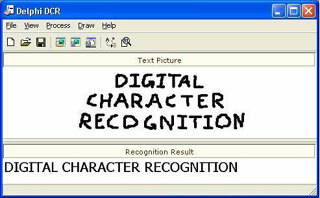 Regular scanners can also be used for inputting scanned text into a computer ready for digitizing. Image of text being converted to digital. It is also possible to digitize handwriting. 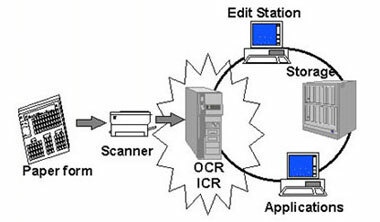 Optical character readers consist of a scanner along with special software. OCR's allow us to scan text on paper (hardcopy) into a computer. 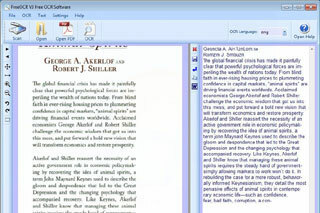 Once into the computer, OCR software converts the scanned text into a digital format. The digital version of the text can be edited and formatted. Used in the processing of Passports and Identity Cards. OCR is also used in the process of digitizing books. Note: book digitizing is where hard copy printed books are converted into digital format for use on E-book readers such as Amazon's Kindle. Very fast way of entering hard-copy text into a computer. The system can have difficulty reading handwriting (especially if it is messy). Cheaper than paying an employee to manually re-type printed text into a computer. As it is not 100% accurate, information needs to be manually checked for errors. This is time consuming. A MICR device reading the magnetic ink on a cheque. (the ink contains iron particles). This special ink is used to write customer account numbers on the bottom of cheques. The MICR device reads the account numbers then converts it to a form the computer can understand. 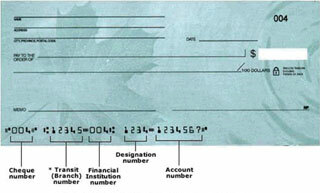 The converted information is then sent to the computer so the cheque can be processed. Every day millions of cheques. are sent to banks for processing. To process the information on these cheques. would take far too long if it were done by hand. 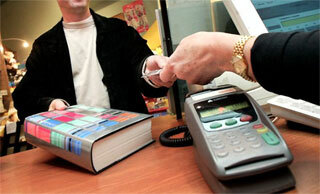 MICR automatically (and quickly) processes the information on these cheques. with 100% accuracy (They can handle 300 per minute). Some countries also use MICR devices to read the passport number on passports. Only a very limited number of different characters can be read. Greater security than OCR because the special ink characters cannot be changed. Both the MICR device Magnetic Ink are more expensive than other methods of direct data entry. No manual input… therefore less errors. Information can still be read even if someone writes over the magnetic ink characters. For example: if someone tries to manually alter an account number by hand the device will still read only the original data.